Visit the UNM Police Department for more information. Your safety and security are of prime concern at The University of New Mexico and the UNM Police Department works hard to ensure the campus is a safe place to live, learn, work and play. UNM is not, however, exempt from crime. UNMPD does their part to prevent crimes, but to be safe and secure, YOU must take common sense precautions, be alert and look out for others. Maintaining an effective police department is a community effort, and together we can ensure UNM remains safe. #UNMStrongerTogether is a UNM Police Department initiative designed to encourage more awareness of and participation in community policing on UNM Main Campus. Launched in August 2018, the initiative mirrors one of UNM President Garnett S. Stokes’ main goals: campus safety. #UNMStrongerTogether utilizes digital signs, social media and campus partners to remind students, staff and faculty about the importance of community policing. Partners of the campaign include UNM Police Department, Resident Life and University Communication and Marketing. 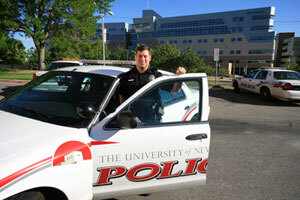 The UNM Police Department is open 24 hours a day, 365 days a year to respond to your needs. They have full power of peace officers on campus, including the authority to enforce all applicable laws, ordinances and campus traffic regulations, and the authority to arrest. Officers are also commissioned through the Bernalillo County Sheriff’s Department. UNM Police encourage students, faculty, staff and visitors to promptly report all crimes. Crimes occurring on campus should be reported to UNM Police at 505-277-2241. In an emergency you may dial 911. The 911 system automatically traces the location of all calls, which enables officers to respond even when a caller cannot provide the location. 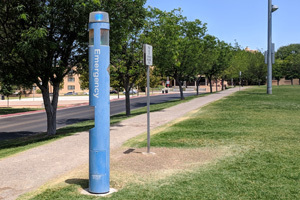 Emergency blue light telephones, which are direct lines to the Police Communications Office, are located throughout the UNM campus. You may use the emergency telephone by opening the telephone box and pressing the button. The Police Dispatcher will answer the telephone promptly, and you will be able to relate the nature of your emergency. Also, a blue light over the telephone will flash for the duration of the call to assist emergency personnel in locating the caller. We ask that you call 505-277-2241 to report non-emergencies. Emergency telephones will not enable you to make calls other than directly to the Police Dispatcher as an EMERGENCY. Special telephones providing emergency services for the deaf are placed at various locations on the UNM campus. The University Police Department is equipped with a Telephone Device for the Deaf (TDD), 505-277-0888 for 24-hour service.